Barcelona - Barcelona's under-fire president Josep Maria Bartomeu launched a counter-attack on his critics on Tuesday by insisting a four-year contract extension for Lionel Messi has been signed by the player's agent and father, Jorge Horacio Messi. Barca announced an agreement with the five-time World Player of the Year in July, but Messi himself is yet to put pen to paper amid rumours he is unhappy with the running of the club. Messi's current deal expires in 2018 meaning he could leave Barca for free next summer. "It is all agreed and signed," said Bartomeu in an interview with Barcelona-based daily Sport. "There are three contracts: one with Messi's foundation, that is signed by the president of the foundation and the player's brother; a contract with Leo Messi's image rights, that his father and administrator of his company have signed; and the work contract that Leo's father has signed." When pressed on the delay in Messi signing the deal, Bartomeu claimed both the player and club's hectic start to the season was to blame and that it would be resolved within a month. "There are no problems. All that is left is the protocol of the signature. We are calm," he added. Bartomeu and his board have received fierce criticism for their handling of the recently closed transfer window as Paris Saint-Germain enticed Neymar away from the Catalan giants for a world record €222 million. 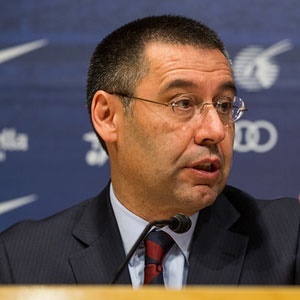 A vote of no confidence motion has been launched by former Barca presidential candidate Agusti Benedito that could oust Bartomeu if it receives enough support from the club's members in the coming weeks. However, Bartomeu described the loss of the Brazilian as an "opportunity" for Barca to build their team around the midfield rather than a superstar front three of Neymar, Messi and Luis Suarez. "The trident was very good but it had its consequences. It is an opportunity to return to the collective football in the middle of the field, which traditionally was Barca's strength. "It is an opportunity, with a new coach, a new project. We need to stop being pessimistic!" Neymar's departure sparked a haphazard shopping spree from Barca, who landed 20-year-old French winger Ousmane Dembele for an initial €105 million fee from Borussia Dortmund and Paulinho for €40 million from Chinese club Guangzhou Evergrande. However, Barca missed out on a host of other targets, including Liverpool's Philippe Coutinho, blaming the rampant inflation in the transfer market caused by PSG and Abu Dhabi-backed Manchester City. La Liga has asked UEFA to investigate both PSG and City for breaches of financial fair play rules. "Qatar and Abu Dhabi are two countries that have two clubs," added Bartomeu. "If Bayern Munich, Manchester United, Real Madrid or Arsenal buy a player from you, you know (the money) comes from football. "But these two clubs distort the market."